Insurance Regulatory Development Authority (IRDA) has released its Annual report for 2014-2015 on 19th January, 2016. Based on the annual report I had listed down Top 10 Best best Life Insurance companies. The criteria for the selection is Claim Settlement Ratio 2014-15. What is Claim Settlement Ratio w.r.t Life Insurance? Claim settlement is one of the most important services that an insurance company can provide to its customers. Insurance companies have an obligation to settle claims promptly. For instance, if a life insurance company receives 1000 death claims and settles 950, the claim settlement ratio of that company would be 95%. We can also calculate Claim Settlement Ratio based on benefit/claim amount paid. The total amount of benefits paid by life industry was Rs 2,11,180.27 crore in 2014-15 (Rs 2,16,395.63 crore in 2013-14). The benefits paid by the private insurers stood at Rs 67,054.52 crore (Rs 58,380.09 crore in 2013-14) constituting 75.82 per cent of the premium underwritten (75.47 per cent in 2013-14). LIC paid benefits of Rs 1,44,125.75 crore in 2014-15, constituting 60.14 per cent of the premium underwritten (Rs 1,58,015.54 crore in 2013-14, 66.69 per cent of the premium underwritten). The benefits paid on account of surrenders / withdrawals stood at Rs 99700.76 crore, of which LIC accounted for Rs 46,537.61crore and private sector Rs 53,163.15 crore. In the current year, in case of LIC, out of the Rs 46,537.61 crore surrenders, ULIP policies accounted for Rs 23,224.49 crore (49.90 percent) as against Rs 38,967.66 crore (65.35 per cent) in 2013-14. In case of the private insurance industry, the ULIP surrenders accounted for Rs 48,657.89 crore (91.53 per cent) in 2014-15 as against Rs 44,541.11crore (94.18 per cent) in 2013-14. In the year 2014-15, the life insurance companies had settled 8.51 lakh claims on individual policies, with a total payout of Rs 11,788.67 crore. The number of claims repudiated/rejected was 18,231 for an amount of Rs 701.69 crore. The claim settlement ratio of LIC was better than that of the private life insurers. Settlement ratio of LIC had increased to 98.19 percent during the year 2014-15 when compared to 98.14 percent during the previous year. The percentage of repudiations was 1.15 percent in 2014-15 remaining almost at the same level (1.10 percent) as of the previous year. For private insurers, settlement ratio had gone up by 1.09% at 89.40 percent during the financial year 2014-15 when compared to 88.31 percent during the previous year. The percentage of repudiations for private insurers was at 7.78% in 2014-15 against the 8.03% for 2013-14. The overall industry’s settlement ratio had slightly increased to 96.97 percent in 2014-15 from 96.75 percent in 2013-14. 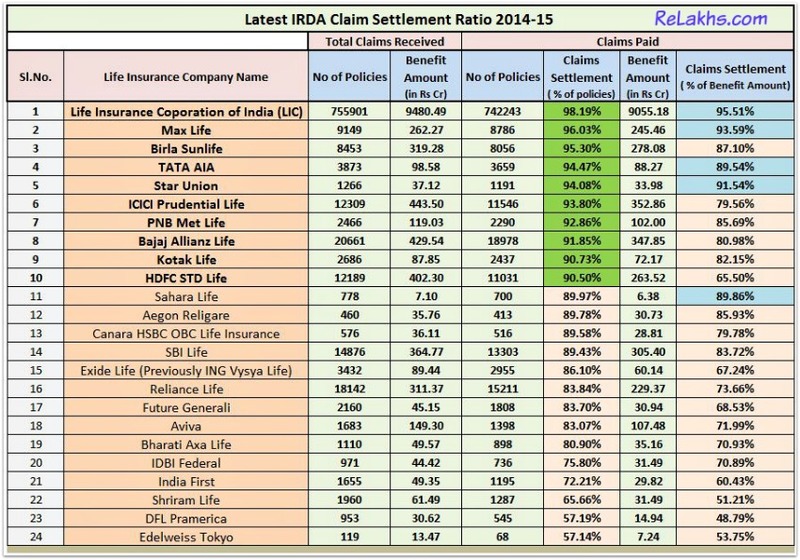 How to read above IRDA Claim Settlement Ratio Table? Let me explain on how to understand the numbers given in the above table. Let us consider Sl.No 1 which has data regarding LIC. During the period 2014-15 the total number of claims (no of policies) received by LIC of India are 7,55,901. This is inclusive of last period’s pending claims (if any) and this period’s (2014-15) claims that are booked or intimated. 7,42,243 policies out of total 7,55,901 policies were settled during the period 2014-15. This translates into a claim settlement ratio of 98.19% for LIC. The total claimed amount (Benefit Amount) on LIC policies during 2014-15 was Rs 9,480 crore. Out of which Rs 9,055 crore worth of claims were settled. As per the above explanation LIC gets 98.19/100. So, what happened to 1.81% (100-98.14%) of claims (no of policies)? LIC : In 2013-14 LIC’s Claim settlement Ratio was 98.14%. This is slightly improved to 98.19% in 2014-15. LIC is the best life insurance company as per claim settlement ratio. 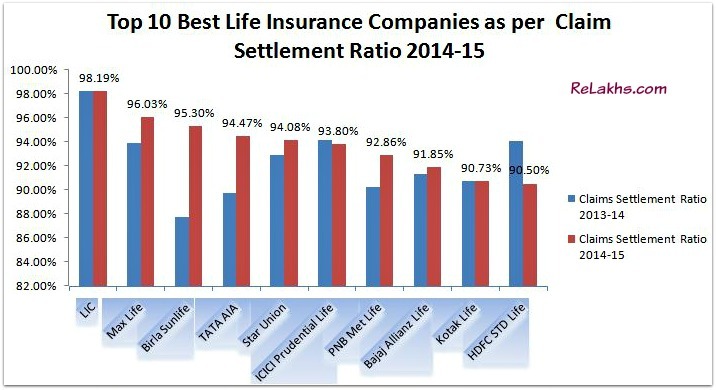 LIC had the best Claim Settlement Ratio in 2013-14 too. ICICI Prudential Life Insurance : ICICI Pru life’s claim ratio has fallen slightly from 94.10% to 93.80%. HDFC Standard Life : There has been a considerable fall in HDFC Life’s Claim Settlement Ration in 2014-15 when compared to 2013-14 data. The claims settlement ratio does not talk about the type of policies i.e., whether the claims that were received are Term or endowment or money back plans. Before buying any type of plan, do look at the company’s Claim Settlement Ratio. But kindly note that Claim ratio is just one of the factors and not THE factor when buying a Life Insurance Policy. Though Claim Settlement record is one of the important factors while choosing your life insurance plan, it is advisable to go for only Term Insurance. You can opt for a Term plan based on the claim settlement record. The other deciding factors can be cost of premium, features, optional riders, quality of service and your comfort level with the Brand. (You may like reading : Top 7 Best Term Insurance Plans). Do not hide any facts while filling the proposal form. This will ensure that your claim (in any unfortunate event happens) is settled. As per the recent amendment to Section 45 of the Insurance Act, If your policy is 3 yrs old, no matter what happens, the life insurance company will not be able to deny the claims. So, your life insurance company has only 3 years in hand to reject the policy based on any mis-representation or mis-statement. Once 3 policy years are completed then the life insurance company has to settle the claims and can not reject them. Most companies cite incomplete documentation or concealment of facts as a reason for rejecting claims. Hence, while buying a life insurance it is of utmost importance that you furnish accurate information and ensure that all paper work is into place. Give importance to claim settlements record and do not get swayed away by higher returns / tax benefits alone. CAN THE LAPSED AND TERMINATED INSURANCE POLICY OF ICICI PRUDENTIAL BE ATTACHED TO ANOTHER NEW POLICY OF PNB METLIFE INSU. BEING TAKEN SIMULTANEOUSLY IN VIEW OF SETTLEMENT OF THE SAME WITH ICICI PRUDENTIAL. PLEASE ADVICE, WHETHER IT IS FRAUD OR SCAM ??? What do you mean by attached? Could you kindly rephrase it, unable to understand your query..
As long as you submit the required details in Proposal form (Application form) honestly and accurately, kindly do not worry about claim settlement. You may go ahead and buy a term plan from any Insurer of your choice. Dear Sir, i want to make Max bupa health companion insurance policy.. should i consider max life claim settlement ratio for max bupa.. have these two same CSR? Dear Aman..You need to have a look at Claim ratio of Health insurance related data and not Life insurance data. Kindly read latest article : Incurred claim ratio of Health insurance companies 2015-16. Iam at 40,Can I go ahead with this term plan->AEGON Life iTerm Plan and tell me whether it covers accidental death and permanent disability. I do have traditional Jeevan Anand,Can I discontinue Policy. Once you get term plan, can discontinue the existing lic policy. Advisable to buy a stand-alone Personal accident insurance plan to get comprehensive coverage. Really insightful article. I am planning to buy term insurance around 1 Cr for 30 years…and shortlisted 2-3 companies…ICICI iProtect, HDFC Click2Protech and Max Life Online…. Out of 3, Max Life has least premium and good CSR…so inclined towards Max Life…. Please note that Max Life has 93% of CSR (%of Benefit) where as HDFC has only 65%…..
1. There is a merger plan between Max Life and HDFC. Can we expect same CSR (% of Benefit) of Max Life after merger or it could be decreased significantly….Also, There is around 3 to 4 thousand of difference between premium of both. Is it good opportunity to buy Max Life and later (after merger) enjoy brand name – HDFC? 2. We are considering CSR as of now…but what is guarantee that same CSR will be there after 5 years…. 3. Should we give importance to CSR (% of Benefit) ? 4. I dont see any difference in buying policy from Insurance company’s online portal and Policybazaar/myinsuranceclub etc….any idea why? PS: Thanks for repeatedly mentioning about Sec 45 of the act…I personally checked at IRDA site and its 100% true…. 1 – Merger has been approved but may take some more months for it to happen. 2 & 3 – As you are aware of Sec 45, kindly go ahead and buy a term plan from a company of your choice. Kindly disclose all the required info in the proposal form. Im zaheer , 33 years young. i want to take a pure term insurance with some riders. Top online term insurance plans. Why one needs to take stand-alone Personal accident insurance cover? Myself Sumit Kumar, aged 36 years, Male, having widow mother, wife, three children fully dependent upon me. I have one LIC Plan “Jeewan Saral” the premium of which is Rs.1500/- per month. I want a plan which would help my family in case of any mis-happening. I can pay monthly premium of Rs. 500/- to 800/-. Kindly suggest the cheat and best plan as per my paying capacity. You have to consider taking a Term insurance plan at the earliest. Once you buy it then you can discontinue the existing lic policy. You may also consider buying a Personal accident insurance plan. Traditional life insurance plan – a terrible investment option. Thanks for your kind assistance on my query. Sir, I want to know which company’s term plan is best one. As you guided me to take term insurance first and then to discontinue the existing policy. The premium of my existing LIC Jeewan Saral Plan is Rs. 1500/- per month. I want to know that if I stop my existing plan premium i.e. Rs.1500/- per month and pay Rs. 500/- more i.e. Rs. 2,000/- in total, then in which manner I should utilized this Rs. 2000/- for term plan and for some saving. Plz guide me. You may a term plan from a company of your choice and based on your affordability (premium rate). Kindly calculate the premium that is applicable for the selected term plan and the savings (if any) can be directed to mutual funds or any other suitable investment avenues for your other financial goals. thanks Sreekanth for your valuable time. I decided to buy a term plan for an amount of Rs. 30 Lacs for 30 years tenure from LIC that too off line because of its claim settlement ratio. Is my decision is correct as per my liabilities? If I got the term plan from LIC then is it possible or advisable to get another term plan from private company like MaxLife for an amount of 15 or 20 lacs as the premium of said company is very low. Or should I can take some another step. Offline or Online – regarding claim settlement- does not really matter. You can buy multiple term plans, there is no restriction (subject to acceptance of your proposals by the insurance companies). Thanks for your valuable time in sharing the knowledge. I want a better future with proper financial planning and need your suggestions on it. Need your valuable suggestions.. Thanks in advance. 1 – Kindly consider buying a Personal Accident cover with Disability risk cover. Read : Best Personal Accident insurance Plans. 2 – Let me know if your parents have adequate Health cover? 3 – If you believe that Parents will be dependent on your in near future and you are going to get married in next 1 year, suggest you to take Term insurance plan with basic cover. Read: Best Term insurance plans. 4 – Has the FD been accumulated for Down payment – property purchase? 5 – I believe all three plans are ‘unwanted ones’ for you. Child plan?? Once you buy a term plan, you may discontinue all these policies and invest the saved premium for your long-term goals. How to get rid off unwanted life insurance policies? to pay an extra premium @ 50% based on my health declaration. serviced by HDFC Life thereafter. claims pending for more than 3 months are only few with them. than 250 claims pending with them for more than 3 months. over by an insurance company with lower CSR. policy holders in such corporate consolidations.? Kindly do not get worried. Even HDFC is a standard company and our Indian Insurance industry is a very well regulated one. If one discloses all the required information in the proposal form honestly (life the way you have done), there is nothing to worry about claims being serviced. Also, kindly note that we do not have separate claim settlement data w.r.t Term insurance plans alone. Kindly buy a term insurance plan (if required) and then discontinue these plans. How to get rid off bad life insurance policies? I appreciate the knowledge shared on this blog for investments & insurance. Just need to know one thing.. I’m going for a 1 crore term plan for 30 years cover from Max Life. My age is 24 & i’m unmarried. But have my mother as a dependent. I checked the info on this plan & found it be in good books of IRDA. Pl suggest if its worth, based on ur knowledge & experience. Dear DEEPAK ..What’s your query? Hi Srikanth, I am 38yrs old and I have taken ICICI Ismart in Apr/2016 (it is just few months old) and the cover is 1Cr. I would like to know if I can reduce the cover from 1cr (current cover) to 50 lakhs so that the premium will less next year. You can forward a request for reduction in Sum Assured to the concerned branch/servicing office in writing. Your premium would be reduced proportionately. Whether your request is accepted or not, depends on the policy terms & conditions. Kindly contact icici pru customer care. And i am confused between lic or icici which company provides easy money to my dependents in my absence. Both are equally good. Suggest you to opt for the company of your choice based on the affordability and your requirements. I am impressed with your blog. your blog is really giving relaxing to users. I want to take term insurance and i want to start investing also. please show me right path. May I know if you have dependents and/or have any financial liabilities? Kindly share details about your Financial Goals..
Age 28, Salaried 4lakh per year. During my colleges days i invested 5000/- in Reliance Mutual fund : RELIANCE EQUITY OPPORTUNITIES FUND – DIVIDEND PLAN just to get some idea on market. 1 – Consider buying a Health insurance plan with high sum assured say Rs 10Lakh or more. 2 – As of now, term insurance may not be required (no dependents). But suggest you to buy a stand-alone Personal Accident Insurance plan. Types of Debt mutual funds. Best Debt mutual funds 2016. However, the priority can be like this Cash, FD/RD and some portion of your savings in Liquid fund. 4 & 5 – For medium term goal, you may start a SIP in a balanced fund like HDFC / TATA balanced fund. For long term goals like Retirement, you may consider investing in one Diversified equity fund and one Small cap fund. Would you think this approach is good? Do you think any other brand(s) can provide best services for 1 cr. term plan in absence to my family? To be frank, I am unable to understand your query. You may go ahead and buy a term plan from a company which you are comfortable with. I have taken Birla Sunlife Dream Plan Enhancer policy in jan 2008 with 20 yrs maturity and till date have deposited Rs.90000. But now i want to discontinue this policy. Please guide me as to what should I do. Dear Tanmay..Is it ULIP or an endowment plan? How to get rid of unwanted life insurance policy? It is ULIP. What are your suggestions? To get decent returns form ULIP policy one needs to stay invested for the entire policy period. Are you satisfied with its performance (returns)? If not, you may surrender it and reinvest the fund value in better options. So it’s fair to say that this investment has been very poor. I will surrender this and invest in Axis LTE. Kindly go ahead. Axis is an ELSS fund, kindly stay invested in it for atleast 5 years or so. Read : Best ELSS funds 2016. Thank You Sir for your advice. I am a big fan of your articles. I am an IT professional and working for a MNC in Delhi. I am sharing my investment to you and please let me know is there any more investment required or it is sufficient for my life ? My annual income is 6LPA. You may kindly provide more details on LIc policy (commencement date, tenure..). Super Top-up health insurance plans. I am 33 years old. My LIC policy (Jeevan Anand) tenure is 20 years. The policy commencement date is January 2011. Already completed 5 years. Kindly give me your valuable suggestion..
Dear Manish..Sugges to surrender the policy and re-invest in better investment options as per your fin goals. Please let me know which investment options will be better as per your suggestion as I don’t have proper idea about the same. I am getting lots of call from different financial organization for investment on daily basis. Dear Manish..Kindly read : List of best investment options. Kindly check below mentioned link and guide me this policy is good or not as I have already provided you my all investment details. Bajaj Allianz agent calling me in daily regarding this policy. Dear Manish..Suggest you to kindly ignore this plan. Thank you very much for your kind support every time whenever asked. I am 27 year old , currently working with a MNC. I am looking for some term insurance plan, which cover both accidental or natural death. i am a non-smoker category person. I have only a LIC 165(Jeevan Saral)policy currently. Please advise which insurance policy will be suitable for me if I am looking for cover of 1CR. Kindly note that all term plans cover both accidental & natural death (unless specified otherwise). Buy a term plan if your objectives is to get adequate life cover. Term insurance Vs traditional life insurance plans. I have LIC JEEVAN SARAL took in August 2013 premium of 36744 annually. You may surrender the policy if you had paid the premium for three years. Read : How to get rid off unwanted life insurance policy? But kindly take a term plan before doing so. I was looking for a term plan particularly to make sure that my childs future education is secured. I am looking for term insurance of 1 cr. I see that the pnbmetlife has a plan where they provide a monthly compensation till child attains 21 and if no unfortunate event happens by child attains the age of 21 then the entire insurance amount is paid as lump sum. Any additional feature to the basic term plan comes with a price. So, if you can afford it and if you think this option meets your requirement, you may kindly go ahead with it. to take basic cover plan + Personal accident insurance policy + Health insurance cover for self & family. I have an offline term plan from LIC for 50 Lakh and online term plan from Aegon for 70 Lakh? Can I switch to online term plan of LIC or any other providers from the offline LIC policy? Dear Bala..It is not allowed. Bala, there is no need to switch. Just stop paying premium for the offline policy and buy a new online term insurance policy from the company of your choice. Whether you can get a Rs2 Cr term plan or not, it depends on the life insurance company’s underwriting policies. Buying a stand-alone Personal Accidental policy can be beneficial instead of taking it as a Rider. Kindly read : Best Personal Accident insurance plans. DEAR SIR I HAVE TAKEN A ONLINE TERM INSURANCE OF SBI E-SHIELD OF FIFTY LAC FOR 30YEAR @7000P/A . IS IT GOOD ? AND WHAT IS CLAIM RATIO FOR THIS PRODUCT? Dear RAJESH..It is a good plan. IRDA do not provide product based claim data. I am 26. Planning to buy 1 Cr, 40 years PNB Metlife term plan in a monthly premium of Rs 710. Cost and tenure is best in industry. Do u suggest buying PNB METLIFE or any other brand? Dear Mayank..If you are comfortable with them and it is affordable to you, kindly go ahead. Read : Best Online Term insurance plans. Dear feroz..As mentioned in the article, unfortunately IRDA do not provide product wise claim settlement ratio. I am confused with Insurance products ,after reading your post i understood the insurance policies especially term insurance. Really amazing. Doing a very good job regarding financial planing and Insurance. keep it and all the very best. Thanks. Thank you so much for the information provided, can you please if possible clarify the below required details. details of claims repudiated or pending or written back for LIC .